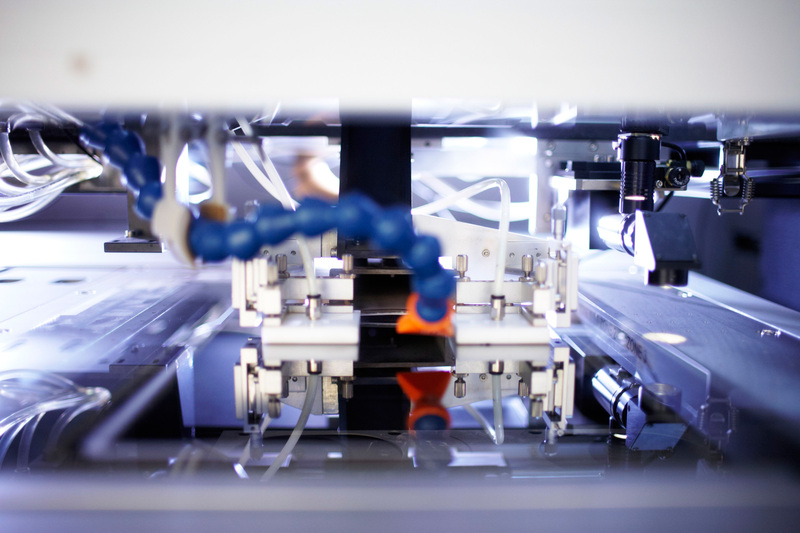 M-Solv prides itself on developing new and advanced laser processes and printing for the energy, large area electronics and IC packaging sectors for both commercial and scientific applications. M-Solv's MSV-500 tool is a multi-head, direct write, step and scan laser patterning tool that has been designed for simultaneous processing on opposite sides of thin panels. The patterns written on opposite sides can be of completely different designs and accurately registered to each other. Two panels are processed in parallel at the same time (such as a 2-up/2-side arrangement), which allows this tool to achieve extremely high throughput. Key features are automatic detection and compensation for panel sag or non-flatness and automatic global and die by die alignment and compensation for panel distortion. Auto load and unload systems are fitted for in-line operation on production lines. The main applications for the double sided laser process are in the micro-electronics sector where high speed, fine scale, complex patterning of thin films on opposite sides of thin glass panels and PCBs is required.